It all began during World War Two when freedom loving patriots everywhere longed for a noble and true hero to lead it out of its darkest days. In a top secret military base a young G-man and scientist, Joe Higgins was chosen to participate in Project Shield. Joe was given an extraordinary suit. It was bulletproof and fireproof. It was also treated with an experimental alloy, that allowed the already athletic Higgins to perform amazing feats of strength. The Shield was faithful to his duty and in the line of duty, one fateful night, his luck ran out, as arch-villain, the Eraser, took him by surprise, His ray debilitated and successfully ended the Shield’s career. 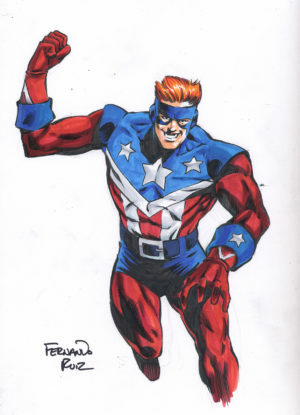 The Shield’s son, Bill Higgins, combined his father’s anatomical formula with a catalytic agent and expanded upon the powers of his father’s uniform to carry on the legacy of Democracy’s greatest champion. The Current Shield has appeared in the Public Service Announcement that featured his origin as well as issues of Archie’s Weird Mysteries. He has continued to fight with the Mighty Crusaders and has taken up his father role as the team’s leader. Bill has retired as the Shield, he has been replaced by his twin Joe Jr., the Shield VI.